In near future Motorola will officially announce a new Motorola v700, which is an ODM-model produced by Chi Mei Communications. It seems to be an ordinary event but it will be the first phone in its class and it is worth to tell about it in details. 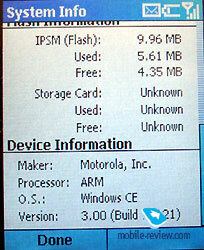 We can easily describe this class – smartphones powered by serial OS from Microsoft. In this case they apply Smartphone Edition 2002. Advantages of such devices, including PDA, are obvious for end consumers. They do not need to get used to new interface, because it is almost a copy of usual OS from Microsoft used in PCs. The same thing files is concerned. What are the main advantages of this approach? Firstly, time spent to learn new devices, is reduced. Secondly, they are more universal. For example, you can easily download files (MS Word, MS Excel) from PC, read them and even edit (in case of PDA). The simplicity of using, universality of platform is the main points of future success. PDA sales data partly can be used as evidence of these words. Share of Palm devices has been reducing, on the contrast – share of PDA based in different OS from Microsoft has been increasing. 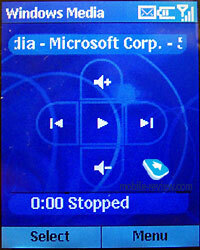 The same situation could be typical for smartphones, the main rivals would be OS from Microsoft and Symbian. It is difficult to say who will be a leader, as the market is only developing now. But we can say that the parity will be reached in near future. This competition will be profitable for end consumers, the price for these devices will be decreased, though functionality will improved. Let’s see how the new smartphone from Motorola looks like. It is not the first product, recently Mitac MIO 8380 was officially introduced and launched on the market. This smartphone is also powered by Microsoft Smartphone 2002. It would be available in the shops at the same time as Motorola’s device. Surely sales of Mitac MIO 8380 would be not so active as sales of v700, because Motorola has higher brand awareness and its products are sold better. 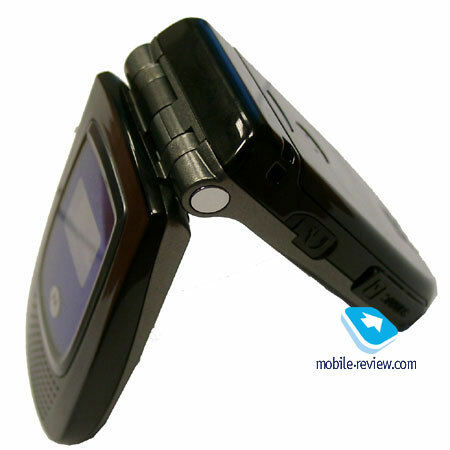 So, we can say that Motorola v700 is a kind of indicator for industry. Plans of many manufacturers could change depending on failure or success of this product. Until now Samsung hasn’t told anything about similar device, though it was developed about 3 months ago. It’s interesting that the main reason of official announcement postponement was Microsoft, which couldn’t prepare OS Windows 2003 Smartphone Edition in time. 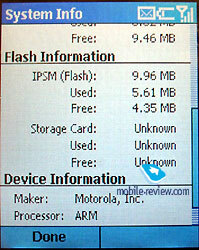 Initially it was planned that smartphone from Mitac and Motorola v700 would be based on this OS. But after some period of time they decide to risk and produce these devices based on relatively old OS and after that make an up-date version with installed Windows 2003 Smartphone Edition. For instance, Mitac will have Mitac MIO 8390. 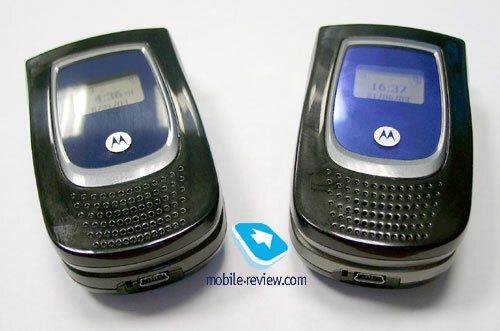 There would be an up-date version of Motorola v700 too, but we speak about it later. There are two clamshell devices in this class. A sub-group of this class joint smartphones of usual form-factor, they are even available in shops, for example Orange SPV E100 (HTC Tanager), Compal Smartphone. (We will be grateful if anybody could send these products to us to test). In our opinion, clamshells are preferable as they are more compact. 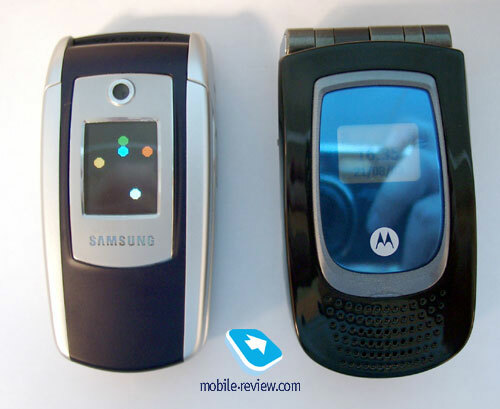 To compare dimensions, you can look at two photos below, where you can see Motorola v700 and one rather small clamshell phone – Samsung E700. The latter one has good ergonomics. Anyway all phones based on Microsoft OS are related to one class. They have almost the same features; differ in set of pre-installed applications and extra capabilities, which depend on manufacturers and their ideas of products developments. Unofficial photos do not help to make an impression about silver smartphone, the color is common and not bright. Probably the company understood it and offered new color solutions. For example, the sample on the photo has a color “Black sea”. This color would be precisely available on the market. The shortcoming of glossy covering is that the phone easily gets dirty; there are fingerprints on the handset after using it. The same problems have most phones with such cases, one of the other examples is Sony Ericsson T610. 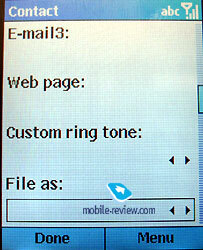 Design of this handset is not approved; a rim around the display can be of k-blue or ink color. The external screen is ordinary. 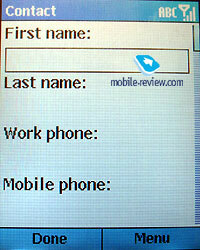 The handset is equipped with monochromic screen, which contains only several text lines. 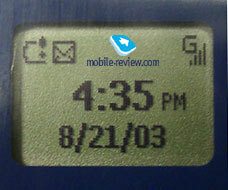 Date, time, line with icons are displayed in the standby mode. Now few words about the phone’s appearance. 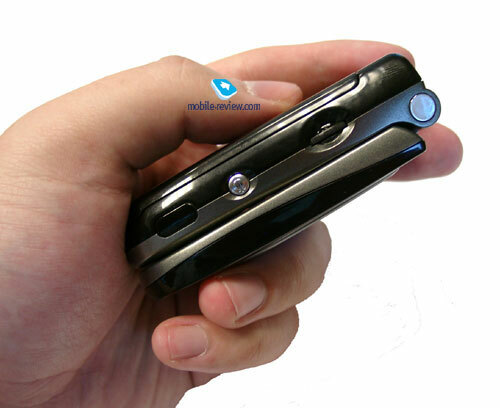 Mini USB is located on the bottom of the phone, it became standard for the handsets from Motorola. IrDA, power on/off key, joystick are available on the left-hand side. 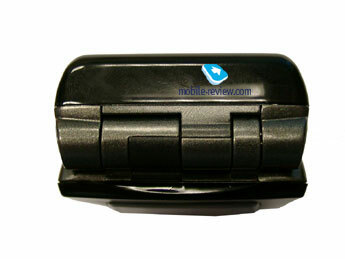 Similar to Sony Ericsson P800, joystick can be moved in 5 directions. Unfortunately joystick didn’t fully work in our sample, for example horizontal scrolling was available but it didn’t react to pressures and vertical scrolls. This shortcoming would b corrected in the commercial version of the product. A special handsfree connector is placed on the right hand side of the phone. 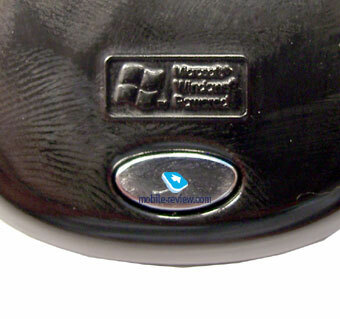 The headset is included in the standard delivery kit. MMC/SD slot is situated under this connector. 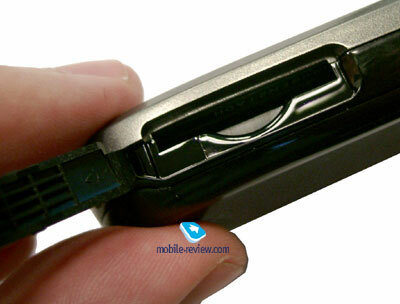 One can see several holes on the external part of the phone, which help to play back ring tones. They are loud; you could hear them almost in all conditions. Vibrating alert is average, possible because of the phone’s thickness. The handset is visible in hands, but it doesn’t look large. Form-factor is really impressive, especially when you know what is inside. 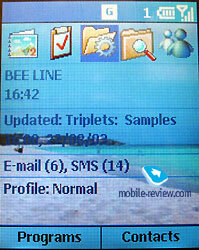 When you open the smartphone, you will see a large display with the resolution of 176x220 pixels. 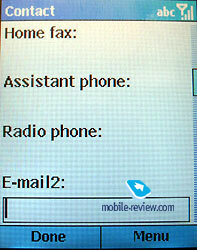 Up to 9 text lines, service line and tips to the soft keys are contained there. The display supports up to 65000 colors, unfortunately it is not a touhscreen. 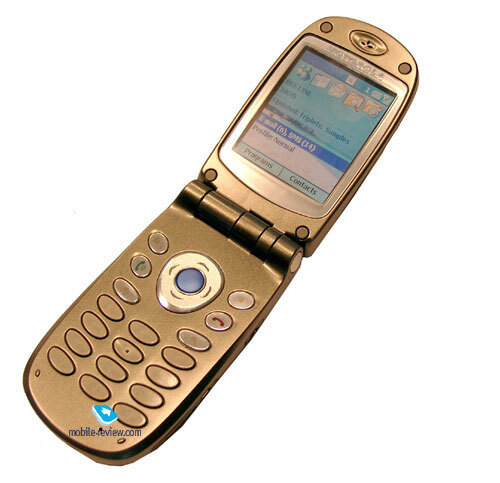 Such kind of handsets will be available in the end of summer 2004. The size of the screen is not large and the picture looks nice there. The second peculiarity is a titanium color of the handset in the open mode. All keys are made of plastic, have round shape and comfortable to press. When you look at them, an effect of lacquer (similar to external surface) is appeared. How it can be reached, it is a mystery. All characters on keys are clearly visible inside, but they are blended under bright sun because of the font size. 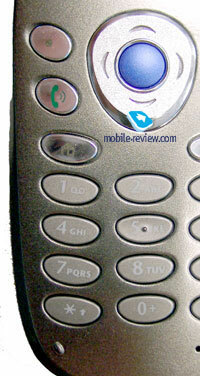 The phone has a 4-directional navigation key with OK key inside. It is very comfortable and allows you not to do unnecessary operations. There are also two additional keys, first one with a house is used to enter a main menu, the second one with an arrow – to return back to upper menu level. Before describing menu and other phone’s capabilities, view short technical specifications of this phone. It is based on ARM-processor OMAP710. It has flash memory and usual memory. They are divided and it is seen on the photo of the screen. Different menus with the information about its work are very pleasing; the consumer could view it as text or graphic. 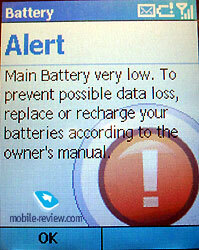 May be you have already paid attention to the battery level indicator. There are two of them in the phone. 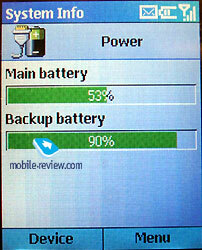 Really, apart from main lithium-ion battery there is a backup battery in the smartphone. 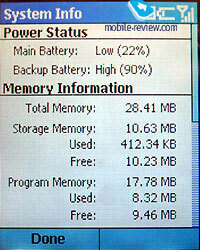 It saves data in the memory when the main battery is very low. Many PDA do not support this function, so many thanks to the developers of this phone. 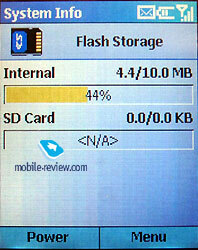 Backup battery doesn’t allow working with the device; it just supplies memory. You can keep discharged smartphone without charging up to one week with a help of this battery and not be afraid of data loss. On the whole it is difficult to lose data in this device. The main way of using smartphone is reading e-mails, receive files, data, take them with you. 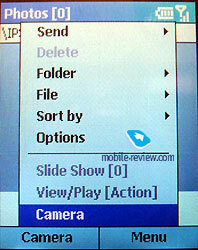 There is a possibility to edit supported files formats, but it is very inconvenient to do without a touchscreen. But many users just do not need them. 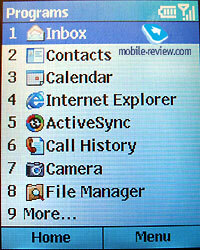 They use PDAs to receive e-mails, view fovourite sites, and have necessary data. This service can be easily provided by smartpones that gives them larger niche on the market. By the way, let’s return to the device itself. You can’t lose data because if you use this device, you will synchronize it with PC several times a week. All necessary data will be available on PC. It’s easy to connect to PC, you need almost nothing to do for it. Availability of standard program for synchronization (IntelliSync) allows to download any applications in the smartphone compatible with this OS. One can find many of them. 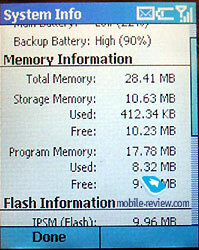 It is one more advantage of this OS compared to Symbian, though many of you will not agree with it. But according to statistic data, there are more applications for Windows than for Symbian on the market. Microsoft has a standard interface, you see last active events on the main screen (reminders, tasks, notes in the calendar, number of new messages both SMS and e-mails). Several icons are placed in the upper part of the screen, they give info about the last used applications, you can call them immediately. Besides, there is a possibility to create own shortcuts for several menu items. There are much more different settings than in usual phone, though dimensions of the handsets are comparable. Well, the file system of the smartphone seemed very comfortable for me. It reminds folders in standard Windows OS used on PC. 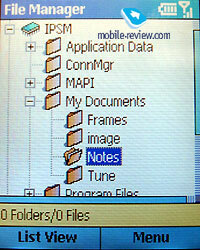 For example you can see such folders as My documents, Programm Files. It is not difficult to understand what kind of files should be put here or there. If you remember file systems of PDA and smartphones based on Linux, you will understand all advantages of these folders, which have understandable names and obvious structure. We will not speak about all programs in this article. Notice that organizer supports different types of events, enormous number of fields can be added to the phonebook. There is also a possibility to record voice tags for several records. Multimedia capabilities of this phone are also very interesting. 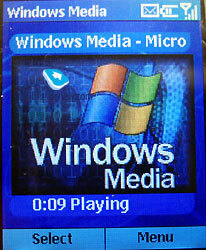 Windows Media Player allows to play back file, player of the third manufacturer is also included in the kit. Mp3-files are also supportedm so, you can use memory card with recorded music and your smartphone will transform into mp3-palyer. The headset has a remote player control. Several sources stated that this phone doesn’t support MMS. We think that it is not true. 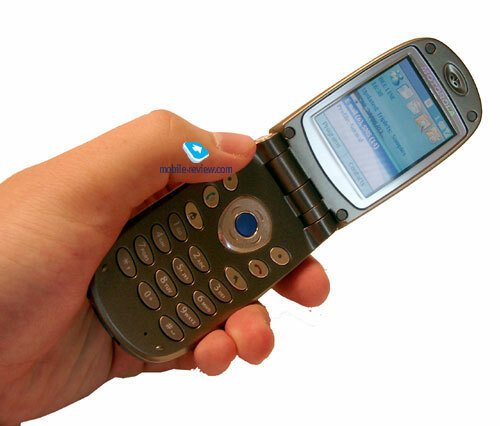 Developers didn’t divide SMS and MMS messages. You create message, depending on its content it remains usual SMS-message or turns into MMS-message. It is not known how this function will be realized in a commercial version of the product. At last several photos of well-known patience. Now it is available in the phone without any changes. On the whole the handset is very convenient as both usual phone and smartphone. 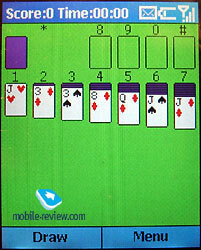 It is ideal to view and transfer information, play back music. Integrated mail client allows not to lose connection with the rest world. It’s very comfortable that you can read of attached MS Word, MS Excel files. Besides, there are many other advantages of this device; we won’t describe them in details. But we think that the idea is very successful. Operating time is about 2 days in case of active using of this phone. The handset will be available on the European market in the end of November and cost about 400-430 USD. In Russia it would be only in the end of December or beginning of January. The price would be the same. Unfortunately current OS almost doesn’t support Russian. It is the main problem of this smartphone for Russian users. But it would be corrected probably in February, when an updated version of the smartphone. 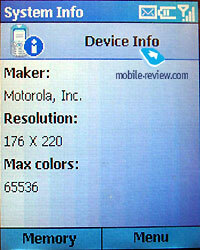 Similar to the second smartphone from Mitac, Motorola will ship updated version of Motorola v700 in February. The main differences are in design, because of the hardware. Firstly, this phone will be equipped with an integrated camera; it is one of the shortcomings of v700. Secondly, the new version will support bluetooth. Finally, and the main novelty is that new OS will be Smartphone Edition 2003. In the end I would like to explain the heading of this article if you haven’t understood it yet. 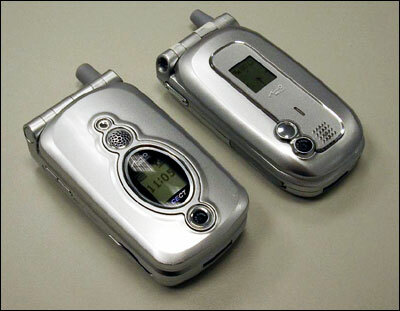 Devices similar to Motorola v700 occupies the same niche as PDAs. The advantages of smartphones – universality, dimensions, price. Many users do not need to edit files but pay attention to universal solutions, a possibility to get access and surf in Internet. In this case these devices overpass PDA and as a result sales of the latter ones would decrease. 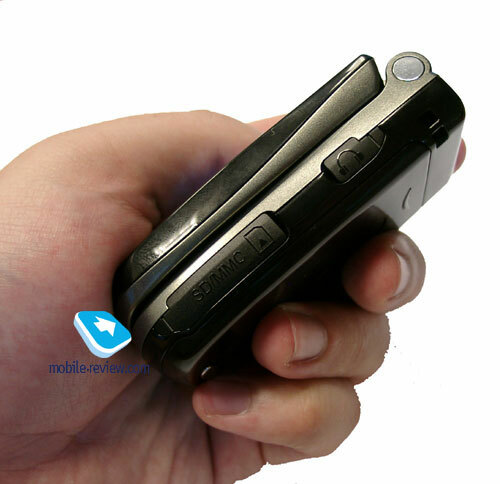 If Motorola v700 and other similar models made by other manufactures will be attractive to end consumers, sales of PDAs could stop grow and begin to decrease if, of course, they do not offer new possibilities different from today’s ones. P.S. If you or your company has a possibility to give us any Windows smartphone for test, please, contact us as soon as you could. It is very important for us.